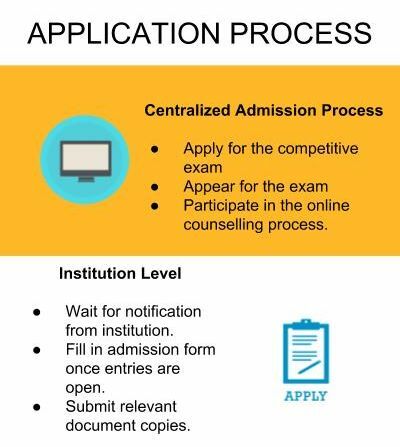 All eligible candidates must appear for their respective State Level Entrance Examination to be able to participate in the centralized counselling process. Once the results are revealed the candidate must then participate in the centralized counselling process. Candidates must select institute preference and await the allotment of seat. All candidates seeking admission under the institute's management quota must wait until the centralized counselling process is complete. There will be a public notice of the number of seats available in the institute level admission round. Applications can be sent forth by filling out details in the application form. Application forms are available in the campus admission office, for more details visit the official website. Seat allotted candidates will be given a stipulated date to complete their final document verification and submission. Candidates will need to report to the campus along with attested copies of the required documents. Fee payment will also be necessary to lock the seat. A final merit list will be published based on applications received. Candidates will be shortlisted based on merit over criteria of ranking at the state/central level competitive examinations like EAMCET/AIEEE. Candidates can even be shortlisted based on marks obtained in the qualifying examination if they have failed to appear for the competitive examination. Candidate needs to have passed the qualifying examination for the respective course. Candidate must have scored a minimum of 50% marks as aggregate. Candidates should have passed 12th Class education in Physics, Mathematics as compulsory subjects with one of the following subjects: Chemistry/Biotechnology/Biology as optional subjects with a minimum of 45% marks from a recognized College/University in order to apply at MVGR College of Engineering, [MVGR] admissions 2019. Candidates who have qualified ICET Examinations are eligible to apply for the course. They should have completed BE/B.Tech in the relevant field with aggregate marks from a recognized College/University in order to apply for the course. He/She should have qualified the GATE Examinations in order to apply. Admission to this college can either be done by securing a good rank in AP-EAMCET exam conducted by AP Govt..And one should get a really good cutoff like rank below 20k to get admission in Mechanical(B-Tech). And one can also join through management quota. The eligible criteria for getting into Maharaj Vijayaram Gajapathi Raj College of Engineering is through EAMCET. The cutoff will be different for diffrent groups and the cutoff for my course was EAMCET rank should be less than 20,000. In order to get into MVGR college of engineering, you need to write either MCET after intermediate or ECET after diploma. In order to get a seat, you need to have a good rank in either of the above. Cutoff may vary from year to year. Well, I have taken the AP EAMCET conducted by the government to enter into MVGR college of engineering. I belong to general category and hence with my rank of 10,300 got the entrance into CSE in third counseling conducted. Entrance through EAMCET for +2 candidate & through ECET for diploma candidate. I took ECET because i am a diploma candidate I got 55 ranks in my branch for obtaining a seat. Candidate must clear the AP EAMCET exam and must have passed the 12th from a recognized institute to get admission in this college.The AP EAMCET rank should less than 40000. 12th was the eligibility criteria of our college. I took AP EAMCET examination for entrance in this college. There aren't any such typical cutoffs for our course. The entrance exam is AP Eamcet Mechanical is the most famous course from our college for only good rankers only. First of all, you must qualify in AP EAMCET exam and you can select this college during the counseling based on your cutoff. 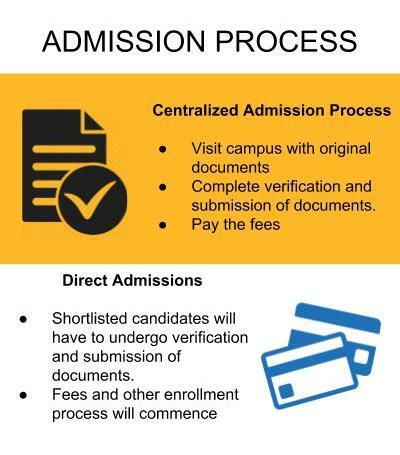 what is the Admission Process of Maharaj Vijayaram Gajapathi Raj College of Engineering for Electrical and Electronics Engineering? eligibility for which is an intermediate (10+2) with subjects such as physics, maths and chemistry. Student should pass through EAMCET and have to attend the counseling to join in to the college.All the certificates of the students should be handed over to the college. The B. Tech EEE program was started in 2001 with an intake of 40 later was enhanced to 60 in 2002, further 120 in 2012.